Private schools have historically been synonymous with elite institutions, but the rapid rise of low fee private schools signals a growing market for community-sourced, adaptable, and accountable education. 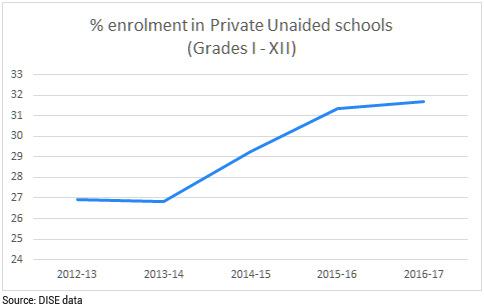 Enrolment data strongly suggest this – in 1996, around 10% of students received private education, while in 2016-17, according to the Unified District Information System for Education (U-DISE),43.18% 1 of students from grades 1-12 attended private schools. India has nearly 400,000 unaided private schools, with more than 7.9 crore students enrolled. A majority of these schools are “affordable”, “low-cost” or “budget” private schools, the terms used largely interchangeably. The graph below shows that private schools are concentrated in the segment charging under 20,000 INR annually. a) Public-Private Achievement Gap: In the Indian context, several studies find clear impacts of private schools on learning outcomes as compared to government schools. 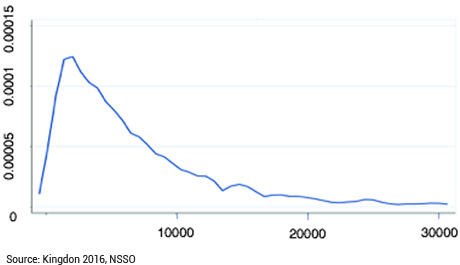 When adjusted for socioeconomic status, this gap reduces but is not entirely removed. Both Desai et al. (2008) and French and Gandhi (2010) compare learning outcomes in public and private schools, using state, district, village and household effects to control for heterogeneity and estimate the impact of unobservables relative to this private school effect. Both studies find significant private school achievement advantage based on standardized tests. However, whether this is true for low fee private schools is uncertain - Chudgar and Quin (2012) found that while initial analysis indicated private school advantage as a composite category, disaggregating the data showed that low fee private schools did not always perform better than government schools. b) Teacher presence, activity, and adoption of approaches linked to better learning outcomes tend to be higher in private schools: Several studies suggest that private school teachers have lower absence rates than their government counterparts, with more per student time, and less administrative activity. (Kingdon and Banerji, 2009, Kremer and Muralidharan, 2008, Muralidharan and Sunderaraman) This could be because there is greater accountability and less job security (lower pay, lower qualification barriers and less union presence creating a highly competitive labour market) for private school teachers. a) Absolute quality: While students at private schools may perform better than their government counterparts, the practical significance of the gap between them might be minimal given very low learning levels at government schools. b) Affordability:Low fee private schools, also called budget or affordable private schools, are not given this name in a standardized way - various researchers and stakeholders define affordability through their own criteria. Data reveals that the median annual fee for private schools is Rs. 5000 (~ USD 70). Yet a study by Härmä (2011) finds that a child’s likelihood of attending private school begins to increase only as they reach the third economic quintile. therefore, it is not clear exactly which income bands private schools serve, and which are excluded. Nevertheless, parents across income levels reveal a significant preference for private schools over government schools, often perceived to be of lower quality. This is linked to economic aspiration, English attainment, computing skills, and low trust of government services. This high demand suggests the potential for growth, and an increasingly urgent need to examine and correct market failures that inhibit improvements in learning outcomes. a) Providing information to parents about learning outcomes: Schooling markets exhibit one of the more classic market failures - that of information asymmetry between supplier and consumer. It is nearly impossible for consumers (in this case, parents), to get reliable information about the quality of schooling that their child is receiving - especially since the only information they get on learning, exam results, come from the school. In the absence of reliable comparative and absolute information about learning levels within and across schools, parents must work with (often misleading) roxies such as infrastructure to estimate school quality, and schools do not have a reliable way to signal investments in improving education quality and link them to learning outcomes. This leads to a market that does not have a strong incentive to innovate on the margin of education quality. One of our priority areas, therefore, is aiding the development of are liable and scalable model for information collection and provision to parents about learning outcomes at their child’s school and at other schools in their schooling market. b) Proposing outcome-oriented and pragmatic regulation: Previous forms of private school regulation have been input driven and arbitrary, largely unrelated to learning outcomes. These have placed immense pressure on low-fee private schools - in several cases, causing closures. The National Independent Schools Alliance claims that more than 4000 schools have been shut down, and a further 7000 have been served closure notices. CSF believes that a private sector focused on quality is an important component of India’s schooling system, and we are keen to drive more understanding and awareness around pragmatic and outcome oriented regulation for private schools that would ensure the sector contributes to our society and people to the maximum extent possible. c) Supporting research about the sector: Better understanding is key to long term improvements in any sector. Given the rapidly evolving nature of private schools and their variations across states, geographies and fee bands, there are many gaps in even basic data on the private sector. CSF will support research that plugs these gaps and goes further to identify key actors, systems, causal pathways, and effective interventions in the sector.